An inexpensive way to add prepared slides to your collection. Learning Resources Prepared Slides Combination Set, 48 Specimens provides young scientists the opportunity to view the world in a new and different way. For a reasonable cost ($16 for me...) I'm able to share something fun and interesting with my daughter which elicits "look at this Mom..." and "what do you think a 'blank' looks like under the microscope?" Upon close examination these are glass prepared slides. Originally I thought they weren't, but after using them a bit I noted that there is a lightweight cardboard cover over the slide to identify the specimens on each slide. Not 'excellent' slides with regards to clarity, but certainly a great starter set: easy to use, simple things to view under any magnification. In all you receive two boxes (set one and two) which include samples labeled as follows. -Animals: cat hair, canary feather, dog hair, sheep hair. -Pollens & Spore: tulip pollen, leaf spore, pine tree pollen, orange pollen. -Tiny Creatures: common red sponge, angora rabbit hair, ant, mouse fur. -Textile Fibers: panya, nylon, wool, handmade paper. -Insects: dragon-fly wing, worker-bee wing, bee antenna, bee abdomen. -Plants: stem of corn, leaf of nerium, onion rind, silver berry scaly hair. -Pollen & Spore: pollen of lily, sunflower pollen, bottle brush spore, fern spore. -Textile Fibers: hemp fiber, silk stuff, cotton fibre, bemberg. -Insects: leg of butterfly, wing of butterfly, wing of locust, let of honey bee. -Plants: pine wood, camellia leaf section, bamboo shoot, sponge gourd. Good first slides for inquisitive youth. Perfect addition to the microscope ! Great fun for my 7 year old! These slides have been thoroughly enjoyed by my 7 yr old son. He received a microscope for Christmas along with these slides, and he is still having a blast studying them now (2 months later)! 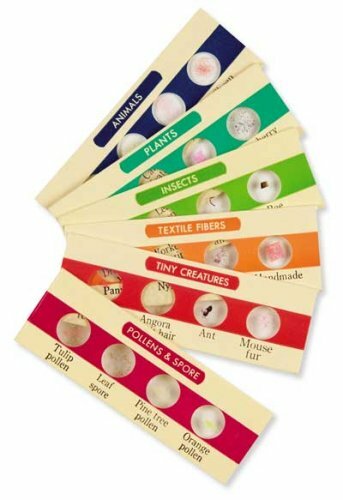 The variety of specimens is plenty to keep a child this age entertained for quite a while. Great quality too!